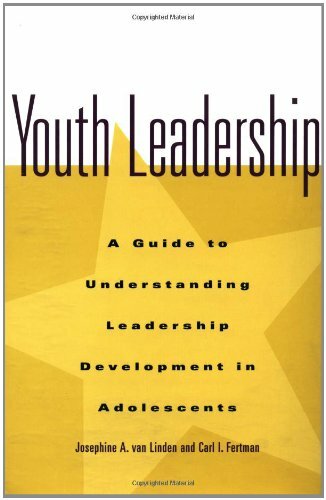 Amazon.com description: Product Description: Based on fifteen years of work with teens and the adults in their lives, Youth Leadership identifies the three major stages of adolescent leadership development. It outlines practical, tactics for developing leadership skills through experiences at home, school, community, and work, and?most importantly?a shows how adults in these settings can have a positive impact. Josephine van Linden and Carl Fertman provide flexible strategies that can be used with adolescents in any program and in varied settings, and offer diagrams, tables, and charts to clarify recommAndations and processes. From teachers and principals to directors of community programs and religious institutions, anyone interested in developing leadership in young people will find Youth Leadership to be a rich source of information and guidance, and an invaluable tool for nurturing the citizens and leaders of tomorrow. Josephine van Linden is director of the Leadership Development Network at the University of Pittsburgh. Carl I. Fertman is professor of education at the University of Pittsburgh. About: Based on fifteen years of work with teens and the adults in their lives, Youth Leadership identifies the three major stages of adolescent leadership development.